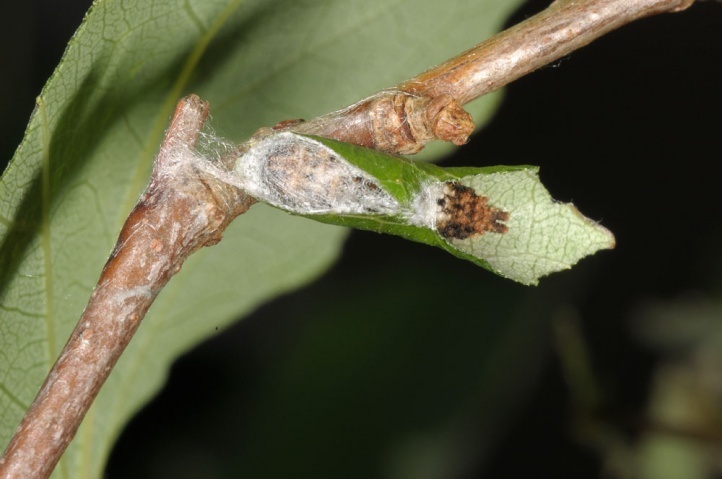 The eggs are laid on Populus tremula (aspen). 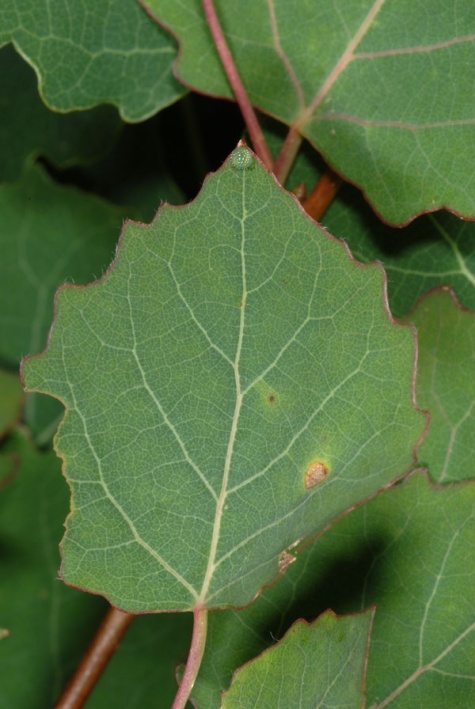 Rarely other poplars (Populus nigra, etc.) 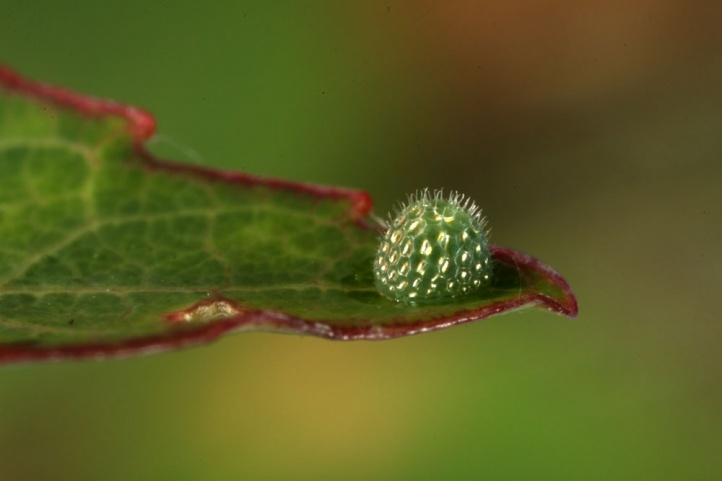 are also used. 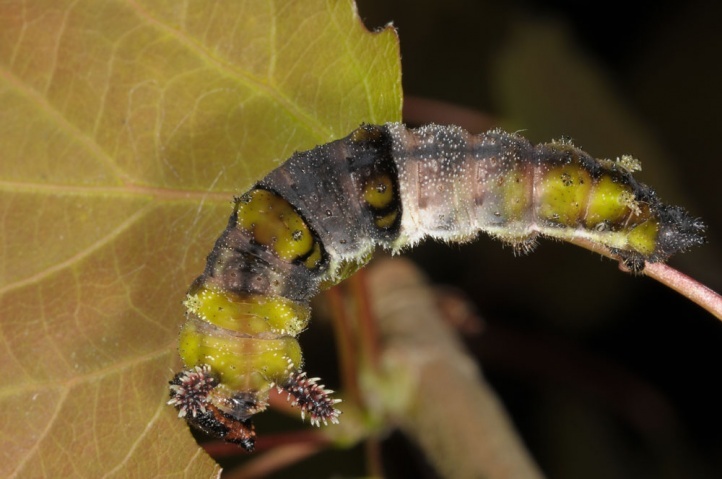 Limenitis populi requires light deciduous forests with large stocks of the larval food plant. 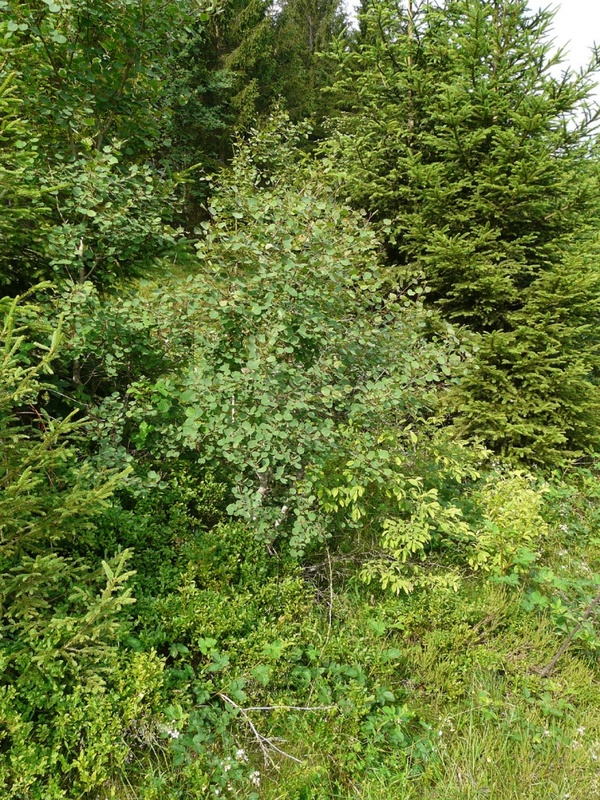 Optimal habitats are moist coppice forest in winter cold regions or mosaics of montane coniferous forests with rich fringes with softwood and aspen regenerations on pastures or fallow land near the forest edge. 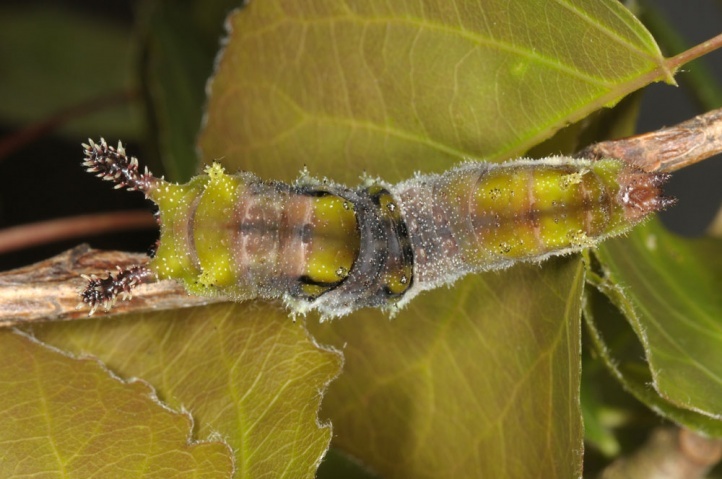 I found, for example, caterpillars at sunny but humid standing aspen in the internal fringes of open woodlands or at easterly exposed, partly sunny young aspen (trees 2 to 4 meters high) in front of a spruce forest edge with abundant aspen regeneration. 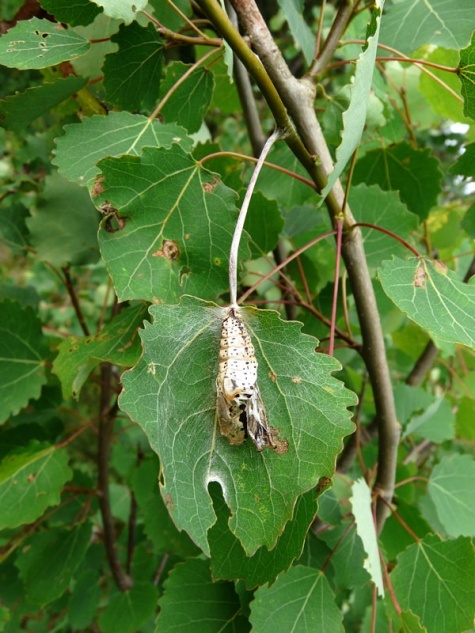 I found hibernating shelters (so-called hibernacula) and eggs from 0.5 to over 3 meters in height. 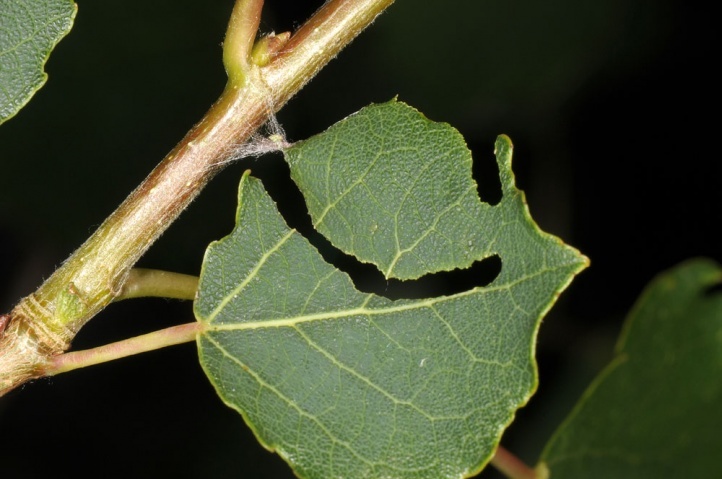 They should also occur at higher trees. 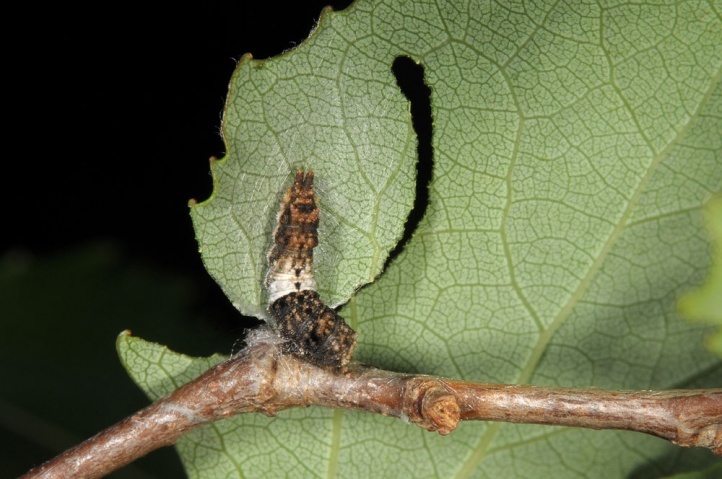 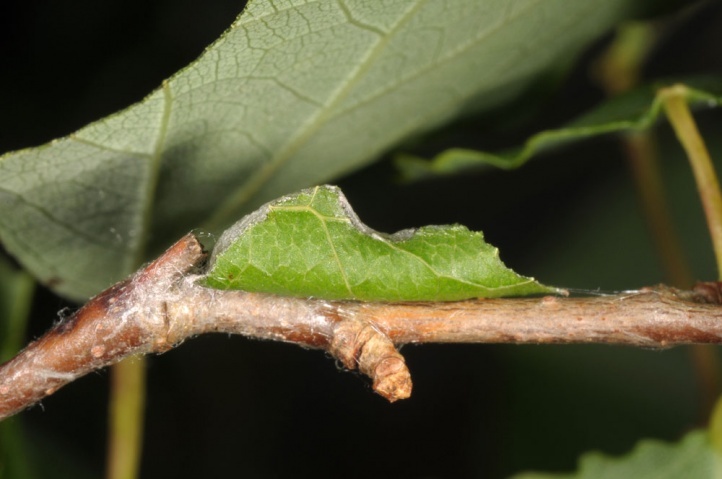 The caterpillar overwinters in a hibernaculum as L3, which it already constructs in late July or in early August from leaf parts. 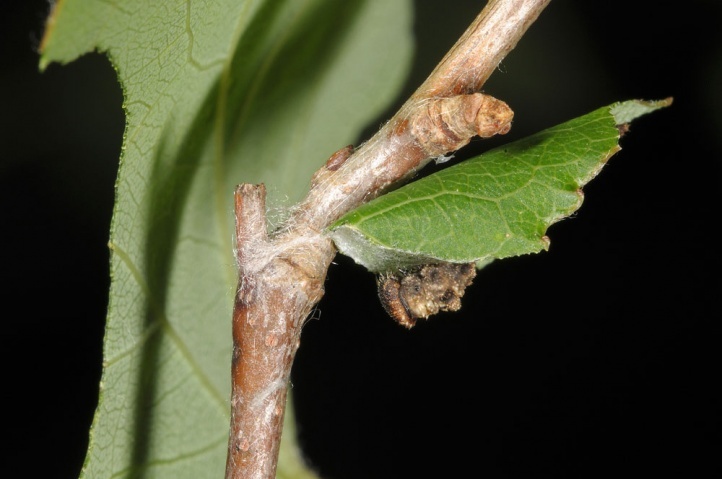 It is mostly attached along the branch (see 3 photo series). 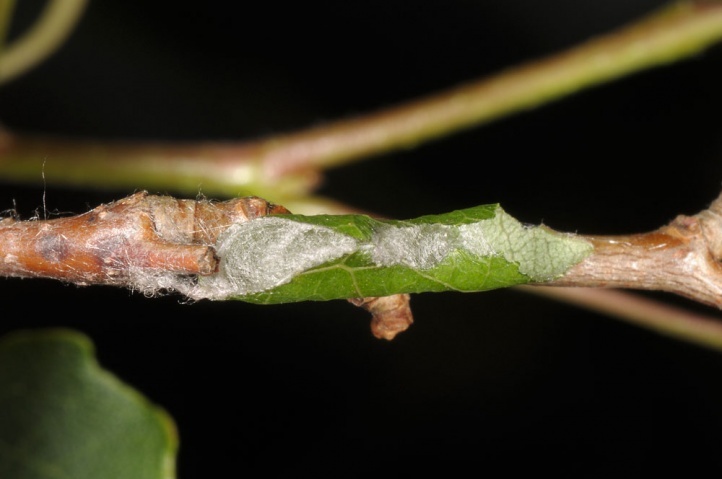 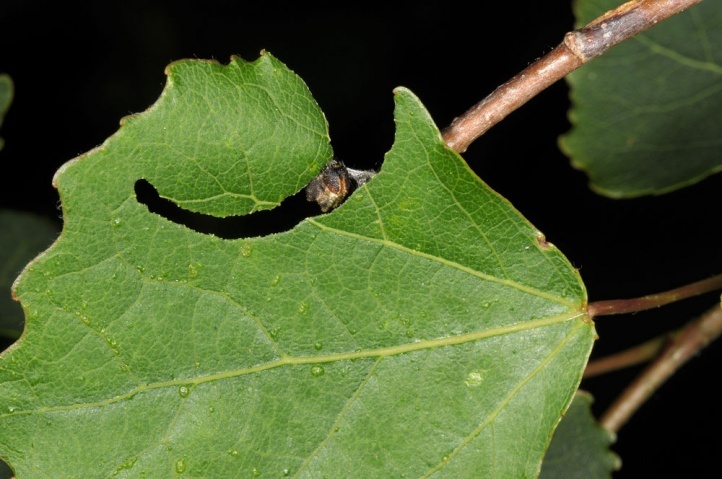 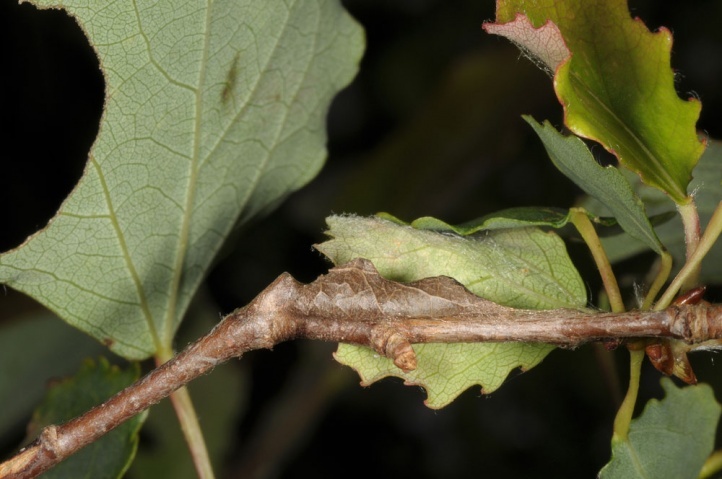 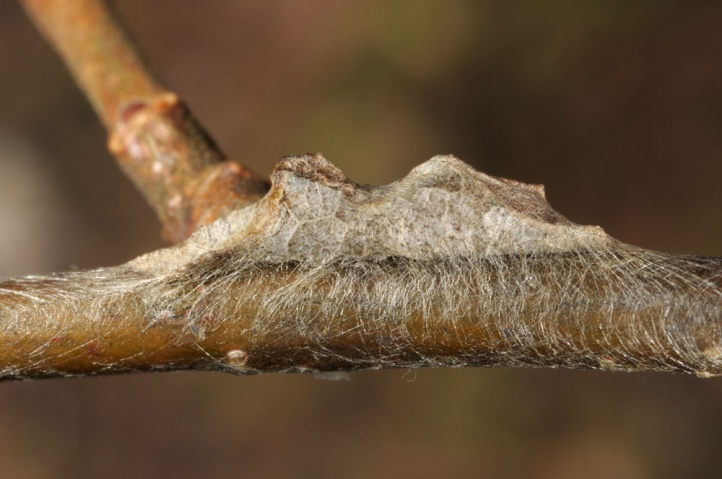 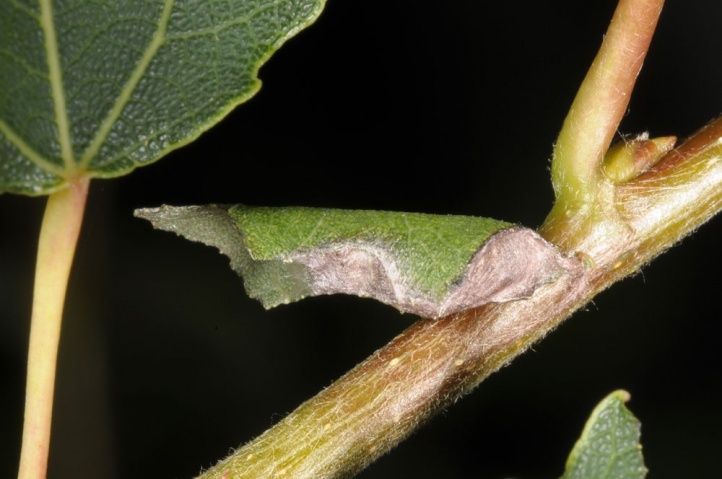 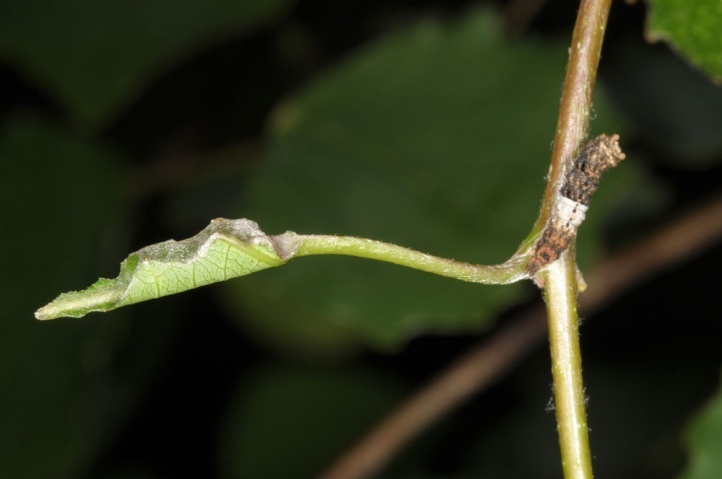 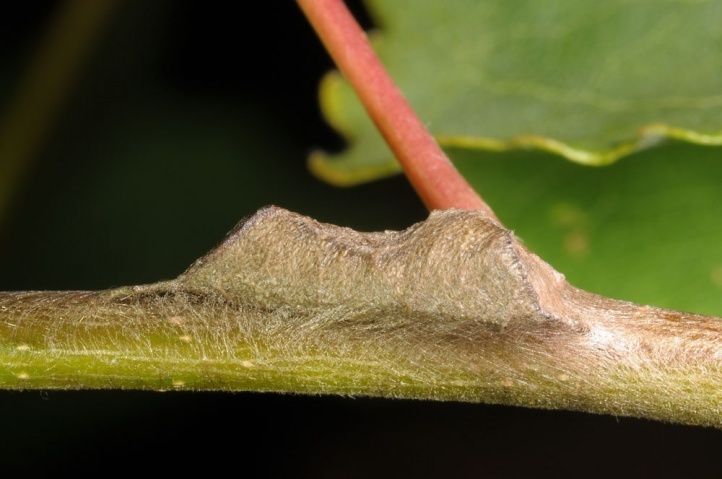 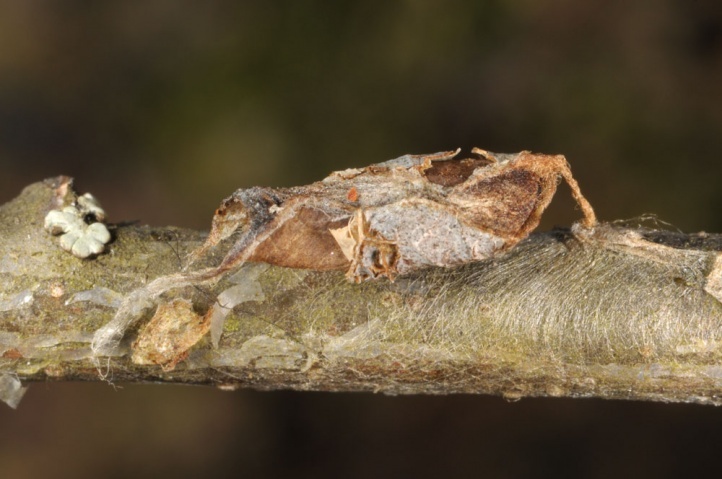 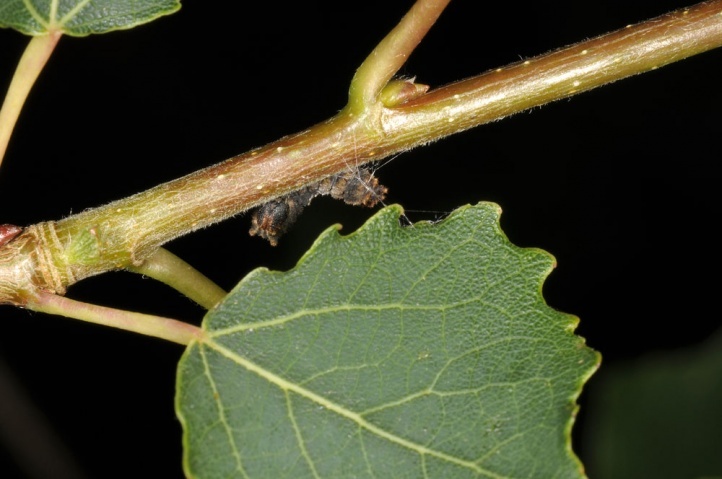 Some of the hibernacula are also so designed that there is no separation from the leaf and this is fixed through the petiole (which is secured on the branch with silk) in the standard way as in Limenitis camilla. 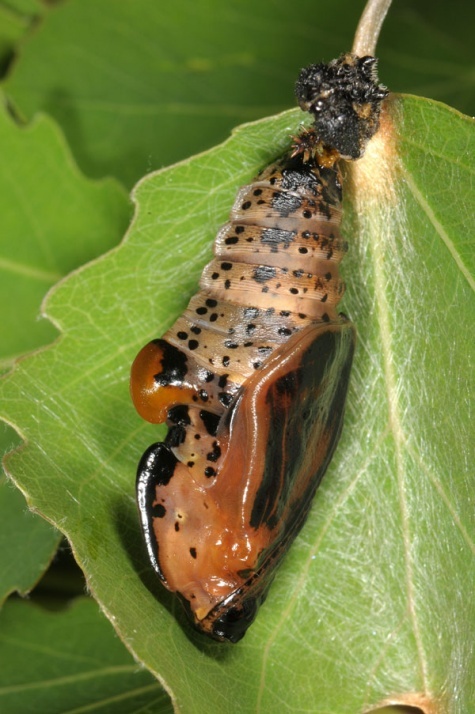 The larva always uses a new leaf in order to construct the hibernaculum (hibernorefugium, hibernarium) and not the last feeding leaf. 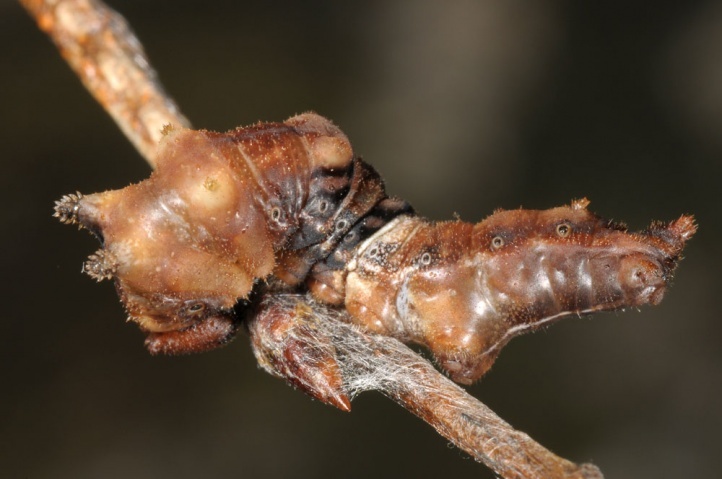 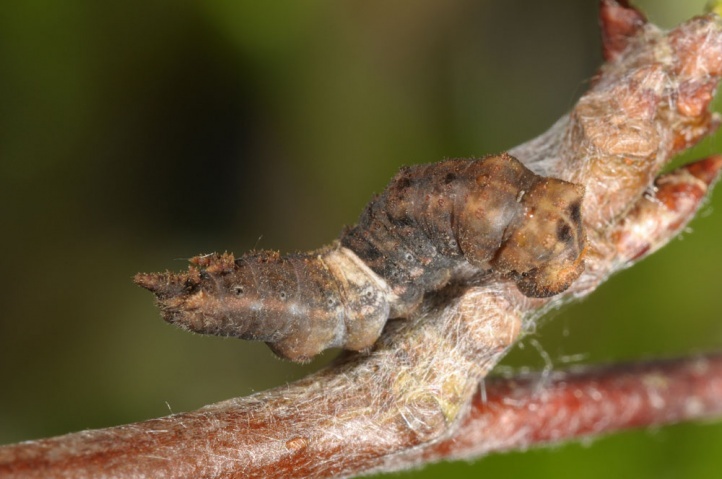 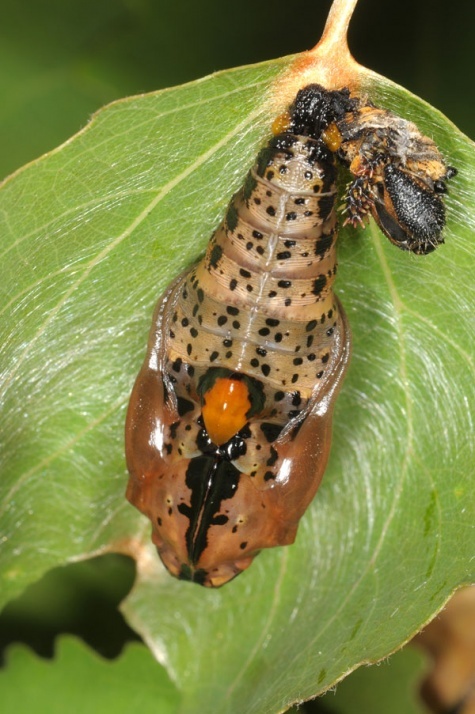 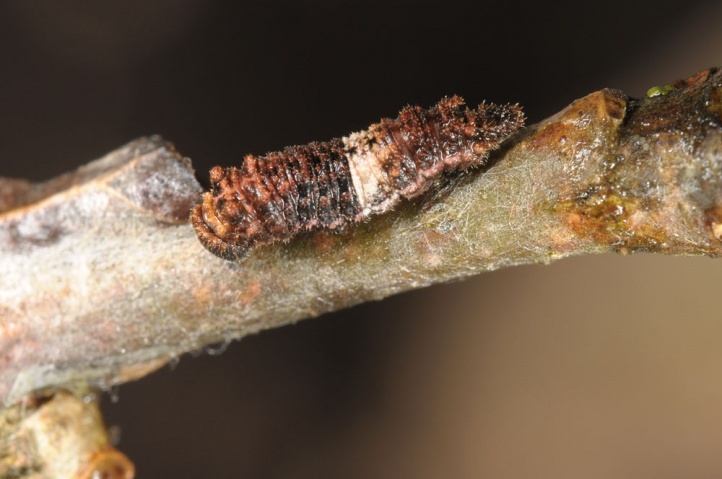 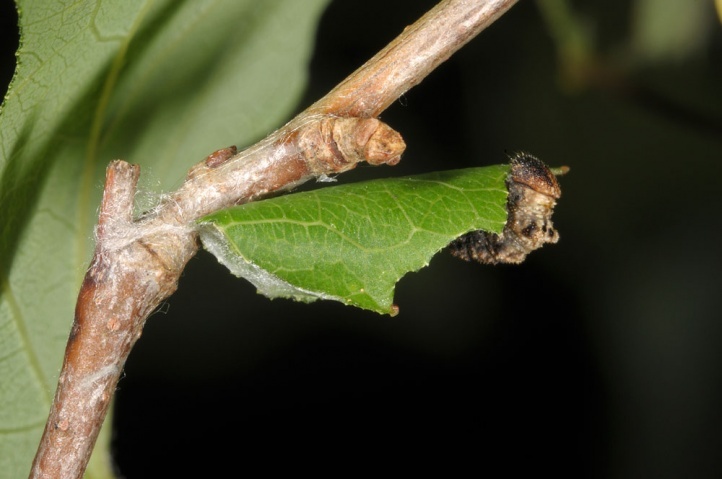 The hibernacula (in winter) and the young larvae with its characteristic feeding pattern (with excrement elongated middle rib in July/August) can be used as a more convenient and safer method for species detection than it would be the case with searching for the butterfly during its short flight time. 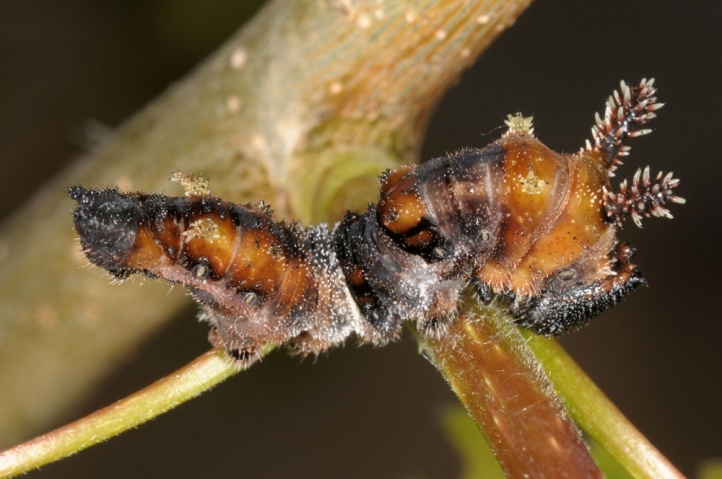 The caterpillar is mature in May or early June. 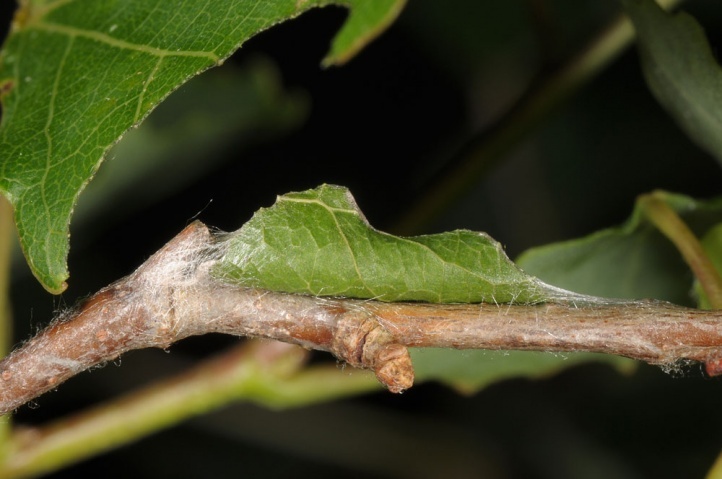 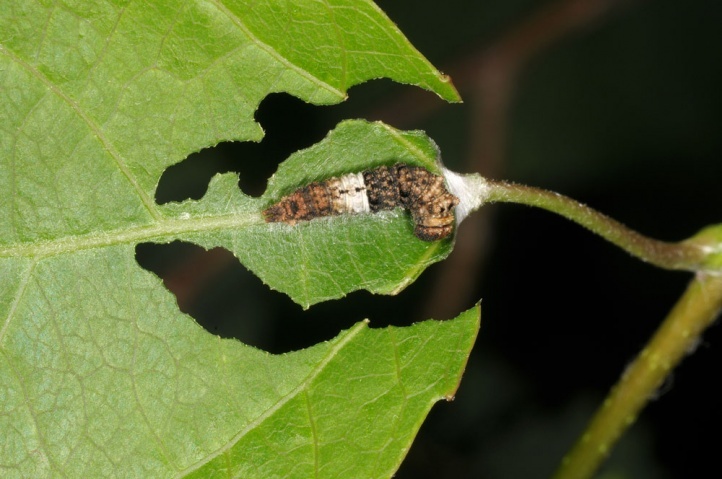 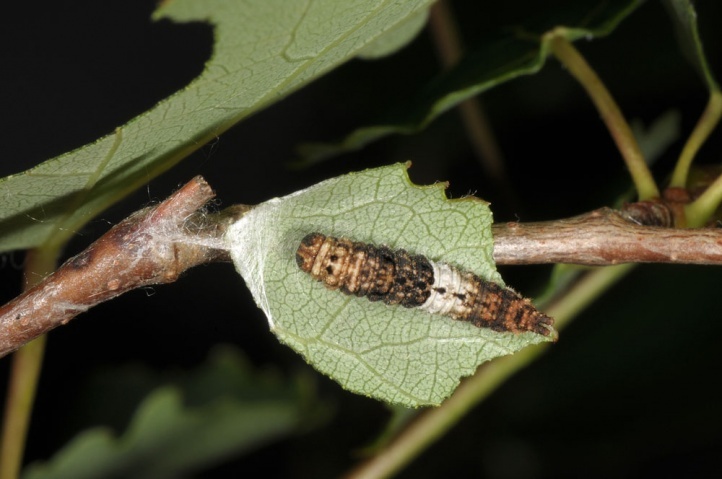 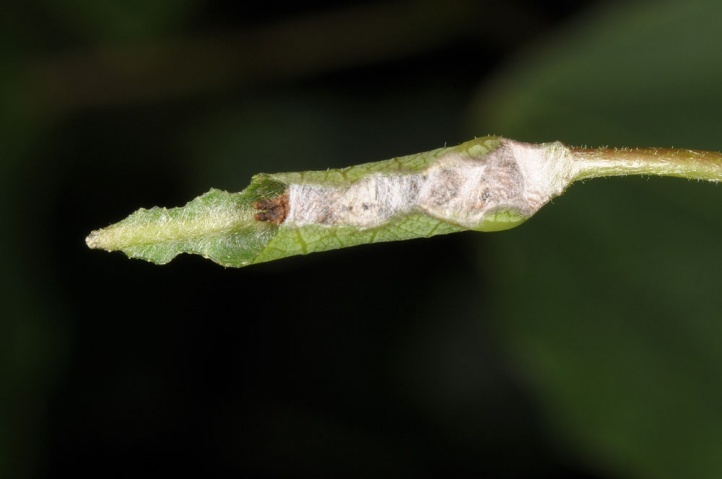 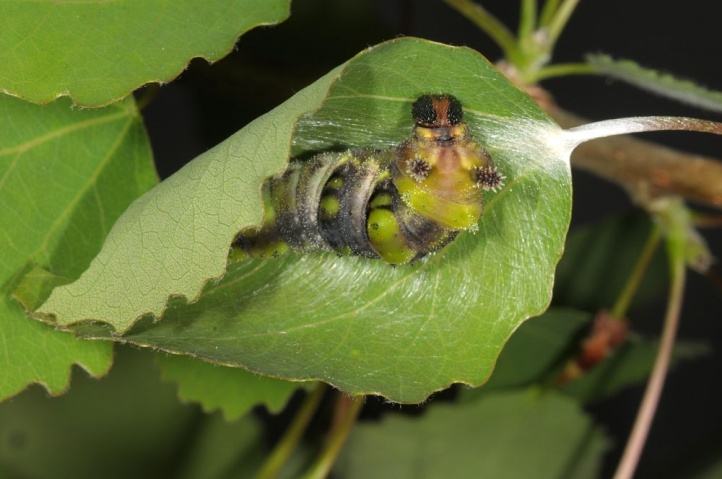 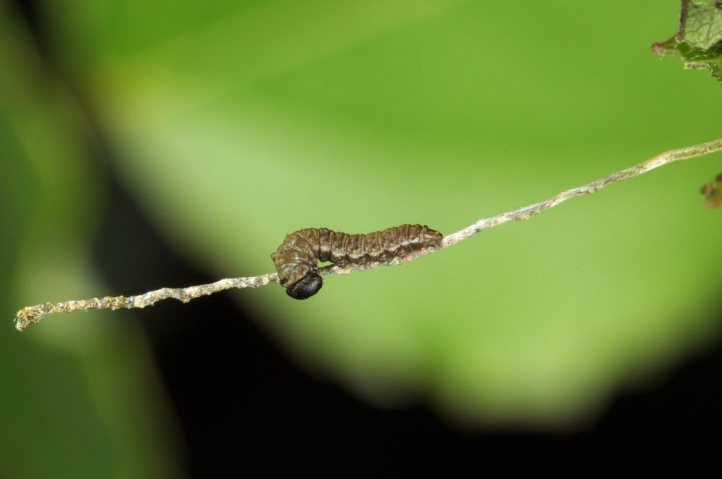 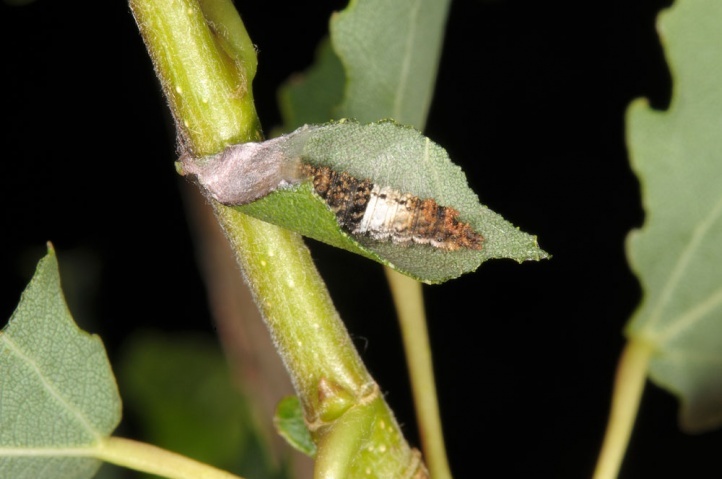 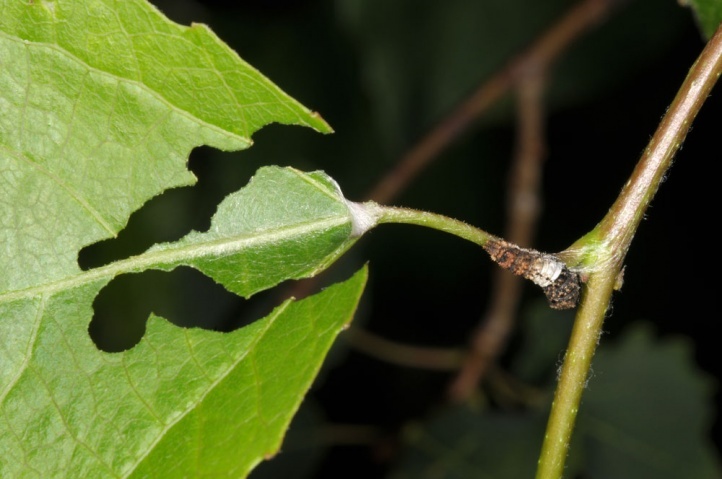 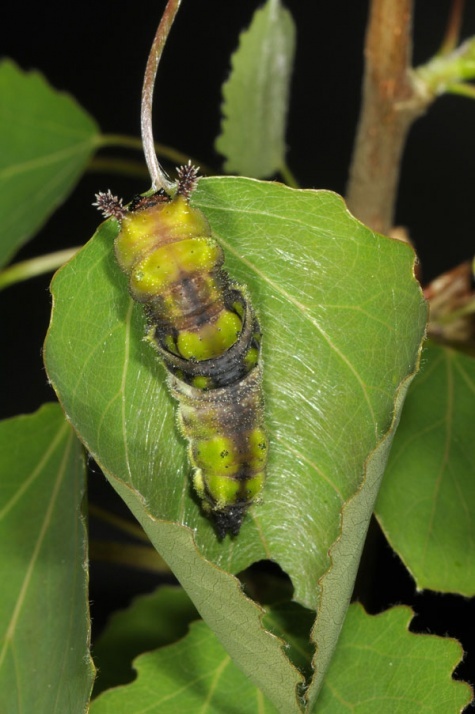 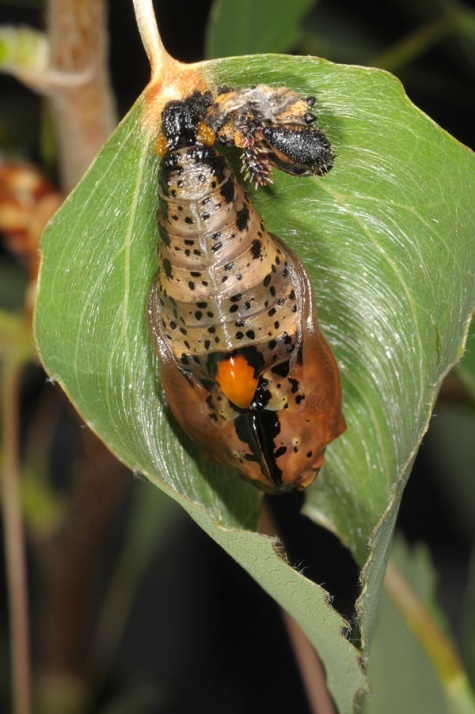 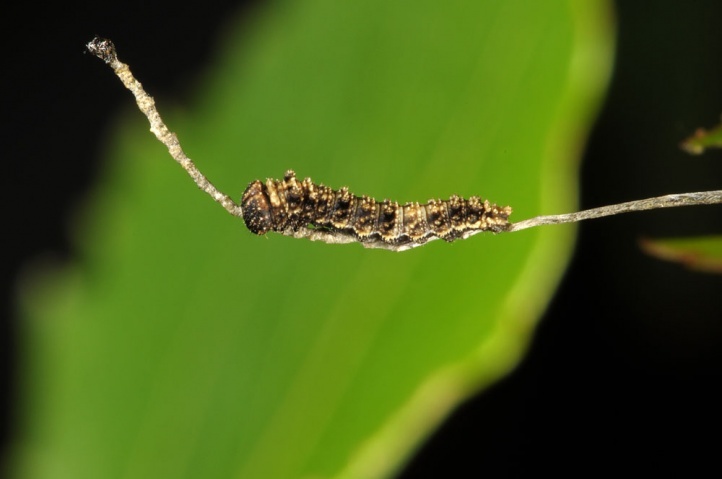 For pupation, the caterpillar prepares a leaf so that this is fixed at the base of the petiole through silk on the branch. 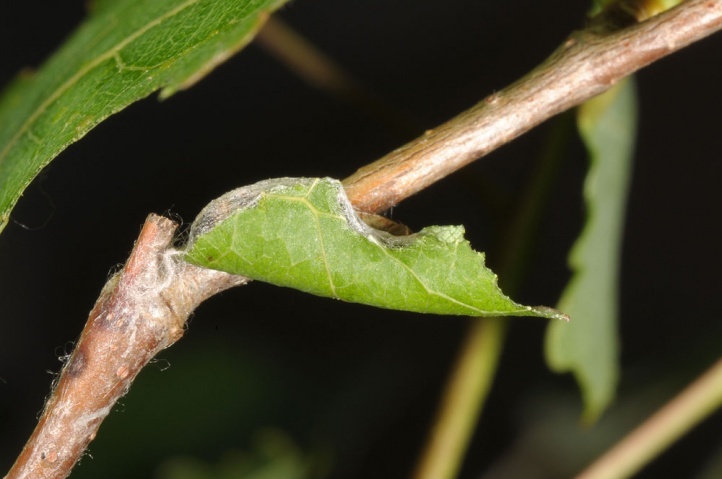 Moreover, the leaf surface is transversely webbed in a way that the edges turn upwards and so protect the pupa that rests on the upper side with its cremaster attached to a web pad in the area of the leaf approach. 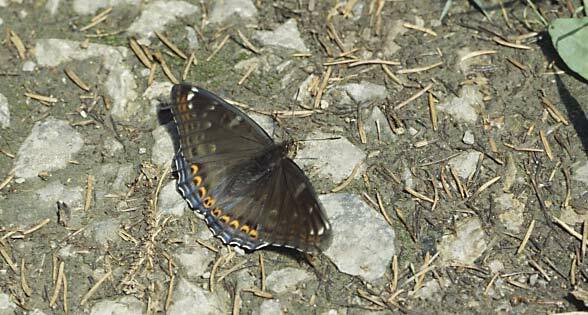 The butterflies are on the wing from late May to early August, with maximum in June, in higher elevations more at the brink of June/July. 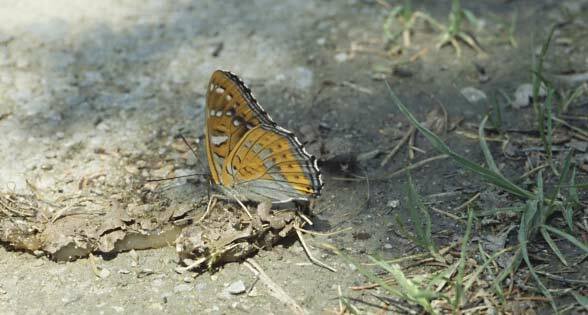 The males sometimes descend to the ground in the morning, especially in order to feed on excrements, etc. 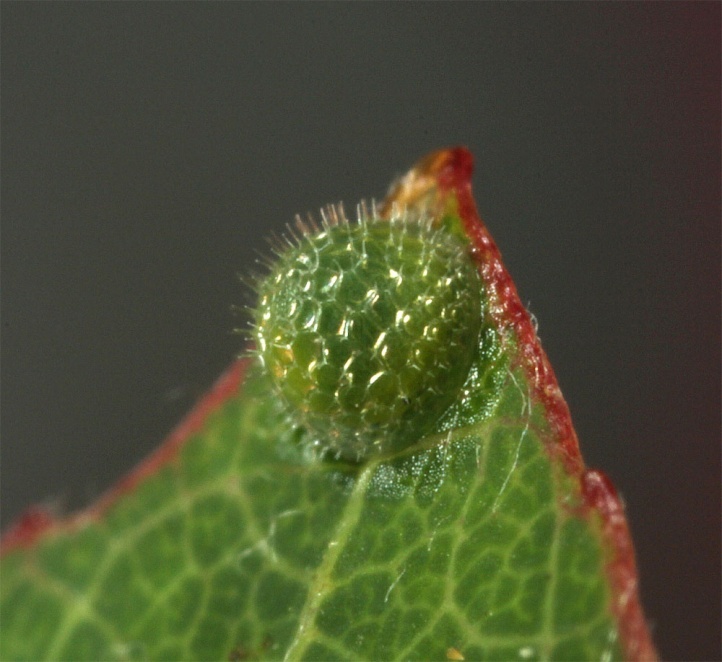 The females are usually harder to observe. 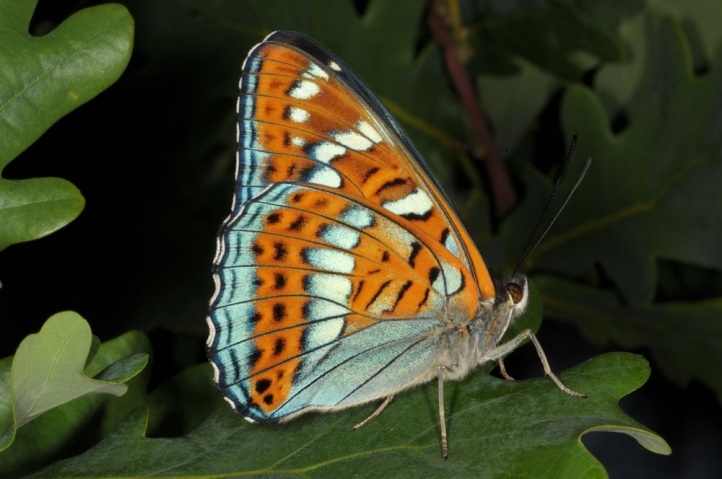 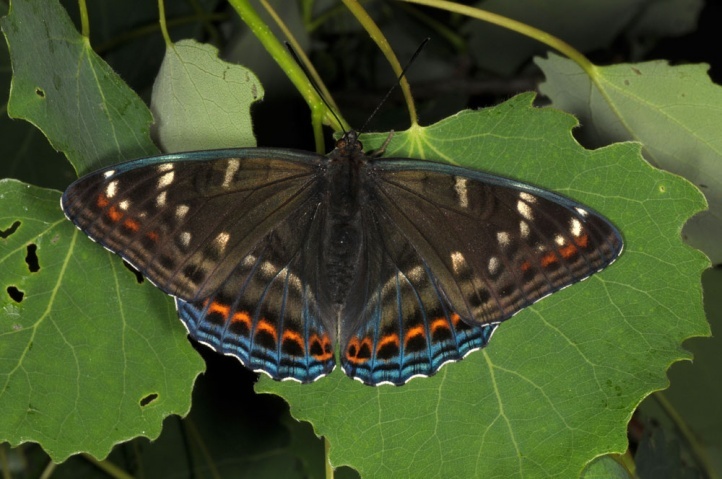 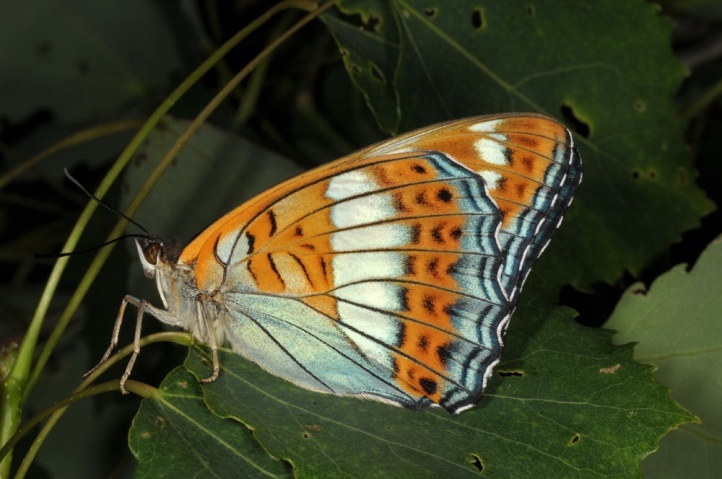 For courtship, the butterflies search for specific marks in the landscapes such as higher trees which are outstanding in the general canopy of the forest (tree top courtship, see e.g. 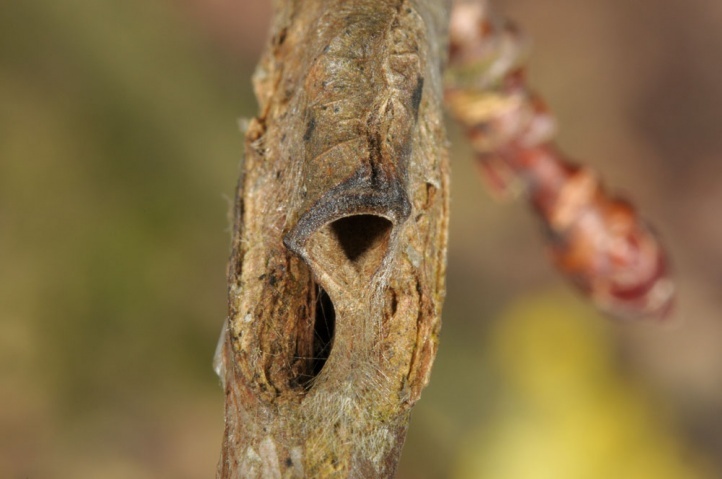 Weidemann 1995) like it is the case with many low-density species. 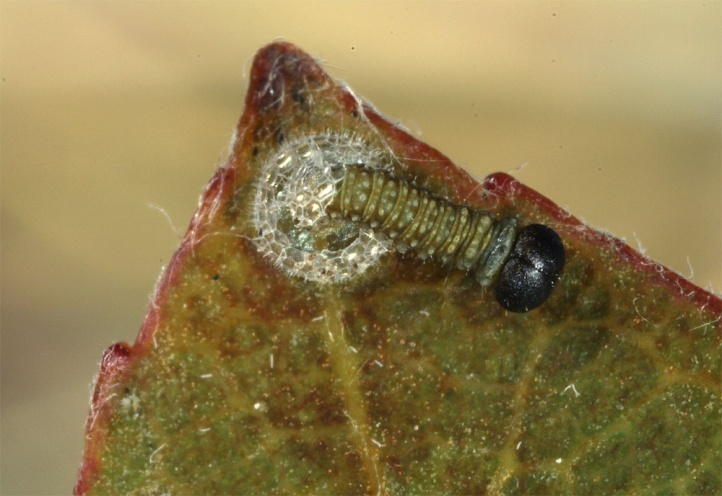 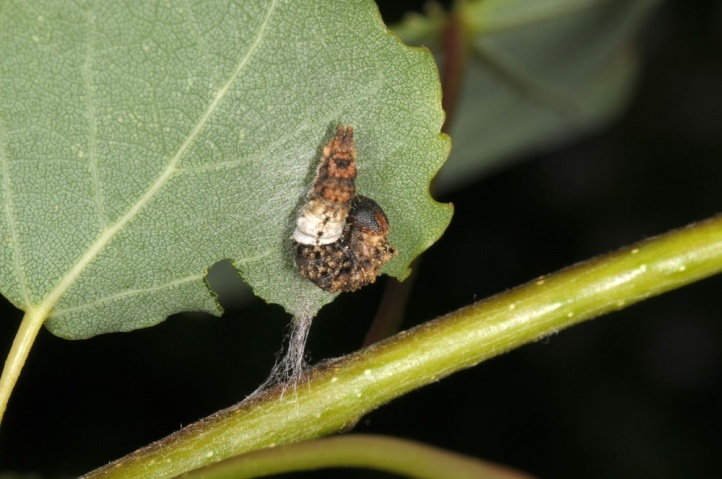 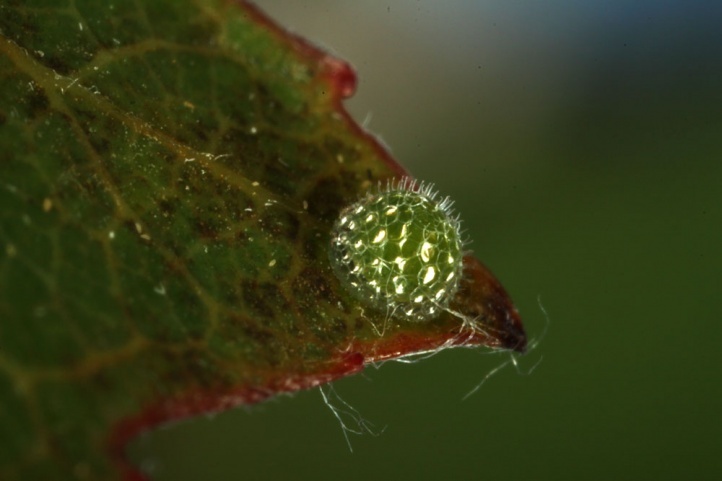 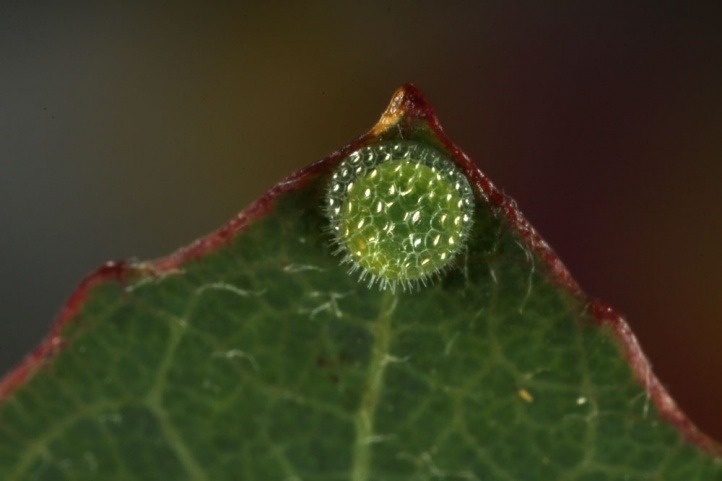 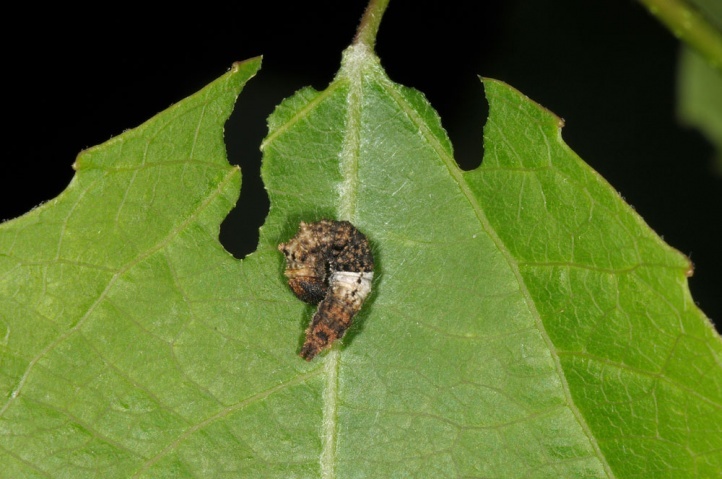 Eggs are laid on the upper leaf surface and in many instances directly to the tip of the leaf. 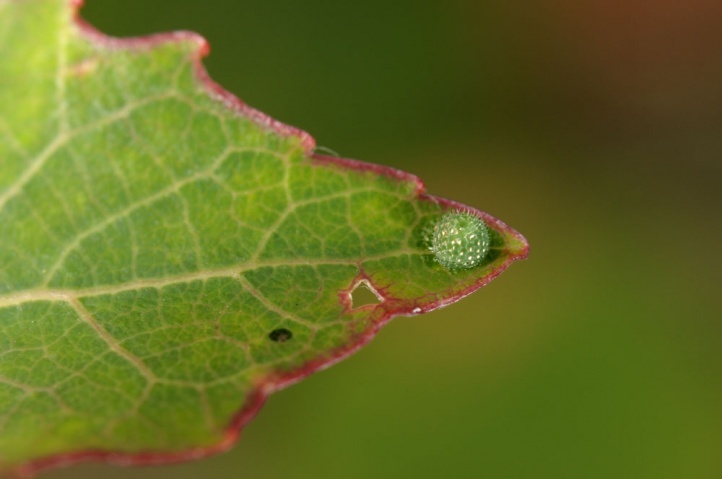 The rather large eggs (significantly larger than in Limenitis camilla) are here relatively conspicuous to a well-trained eye. 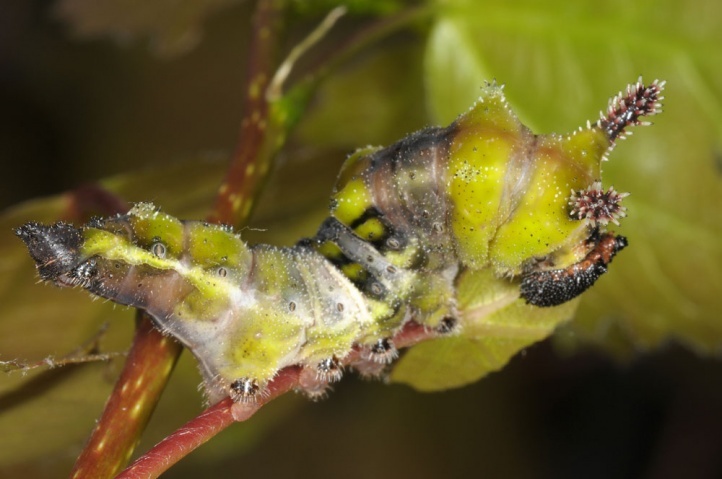 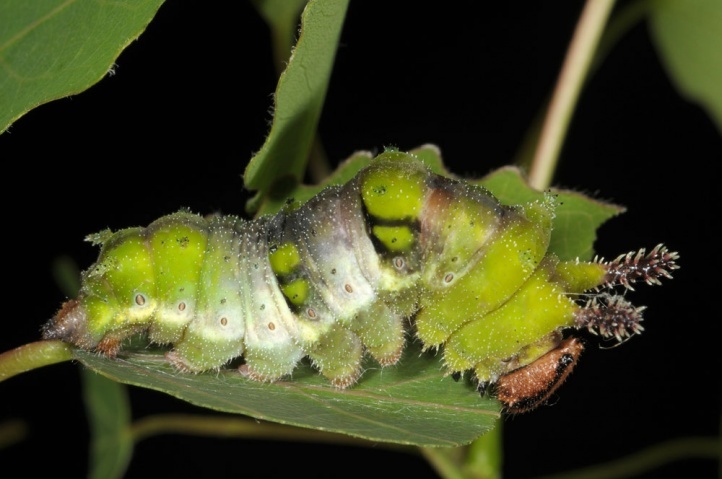 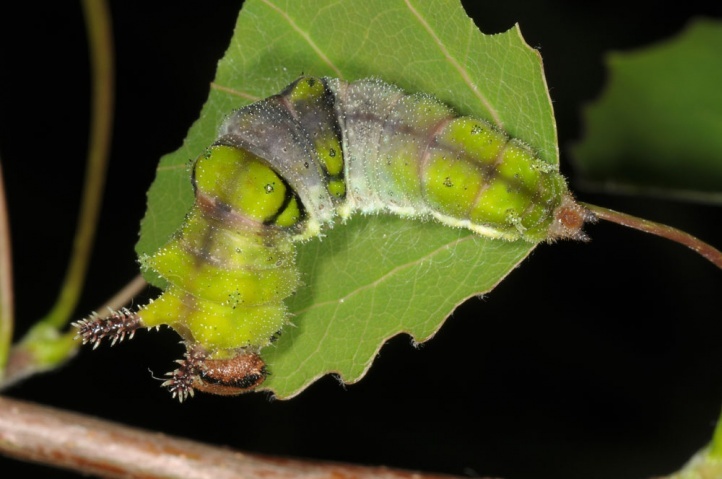 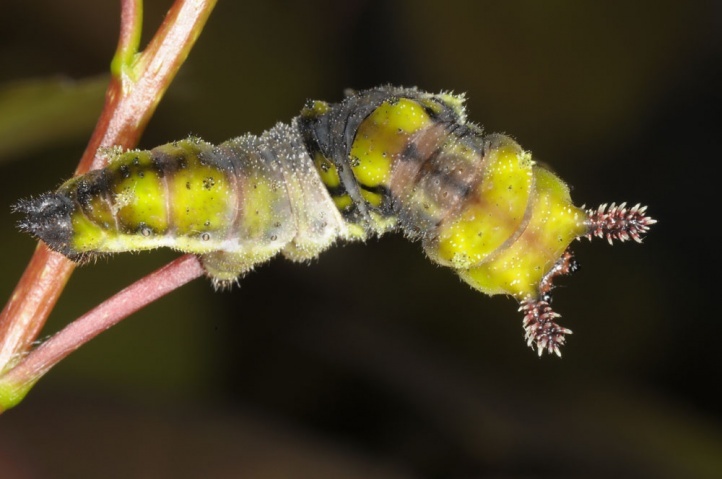 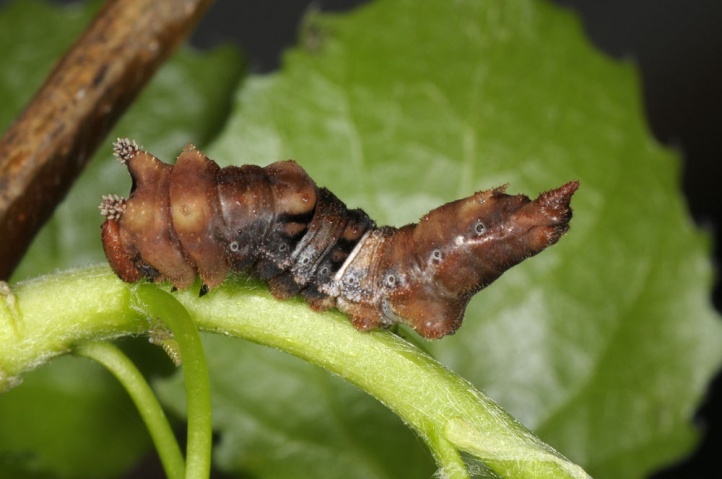 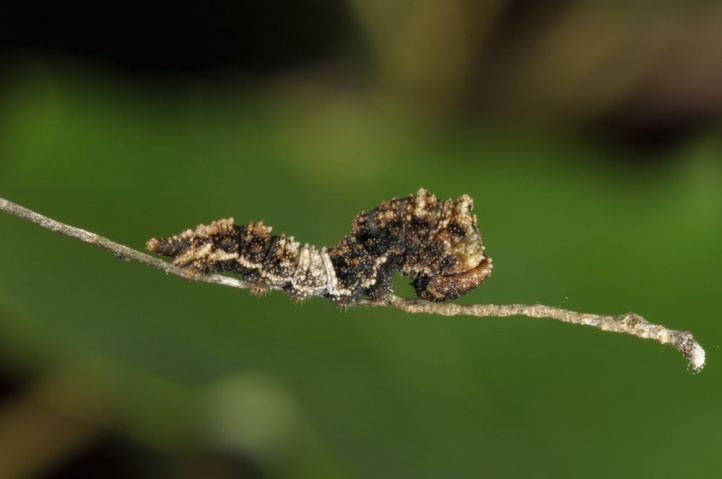 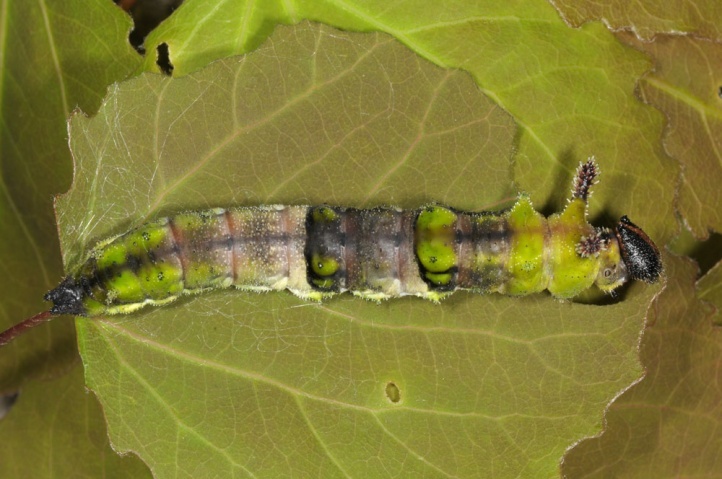 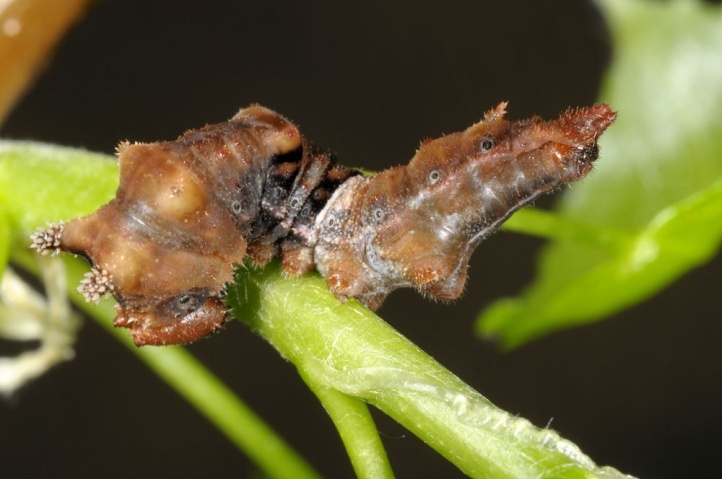 The young caterpillar itself is conspicuous because of its feeding pattern. 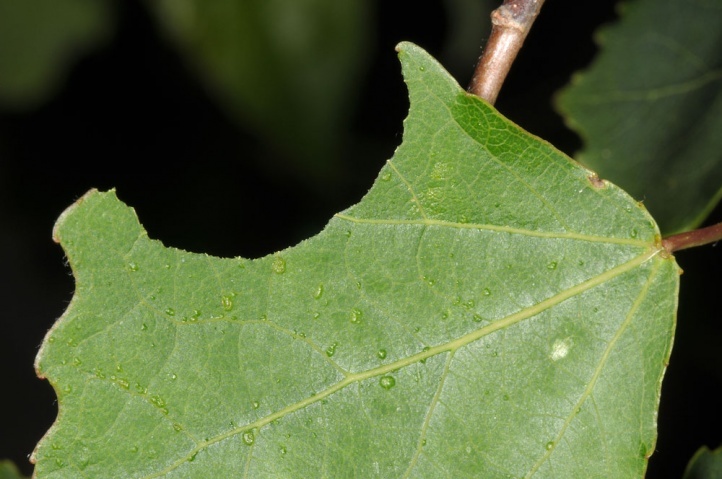 It feeds from the tip and avoids eating the middle rib of the leaf. 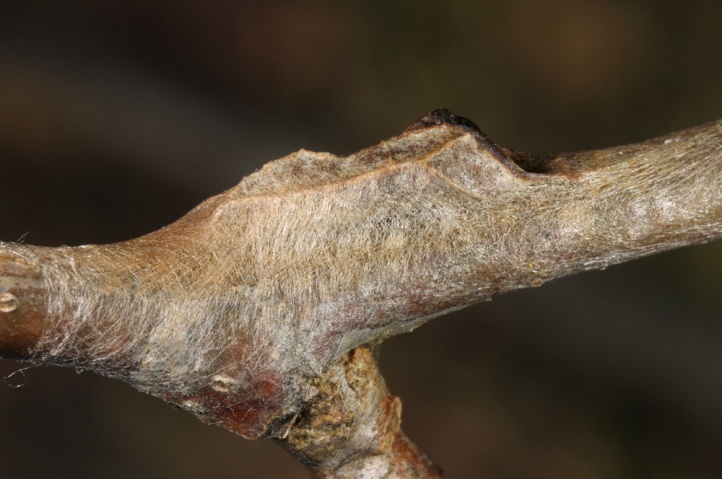 In contrary, it even elongates this rib artificially through webbed excrement and often rests along this rib. 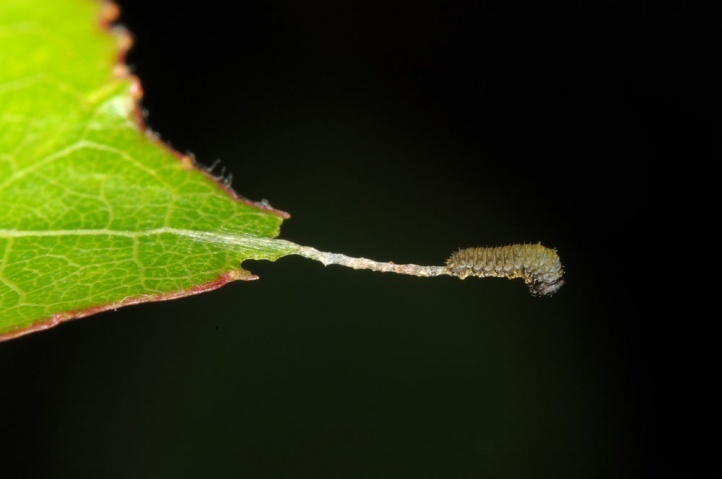 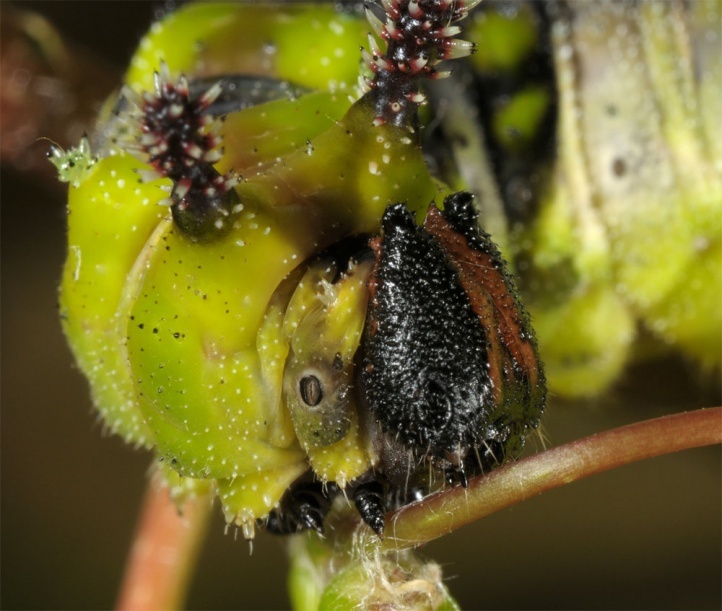 Perhaps this behavior provides some protection from predators such as ants. 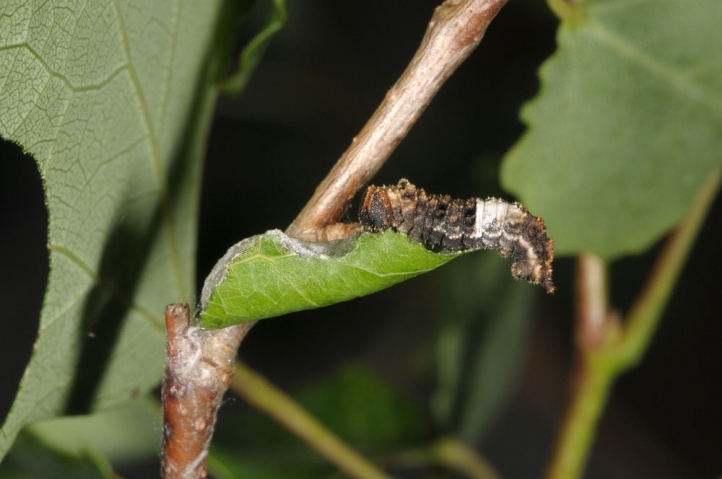 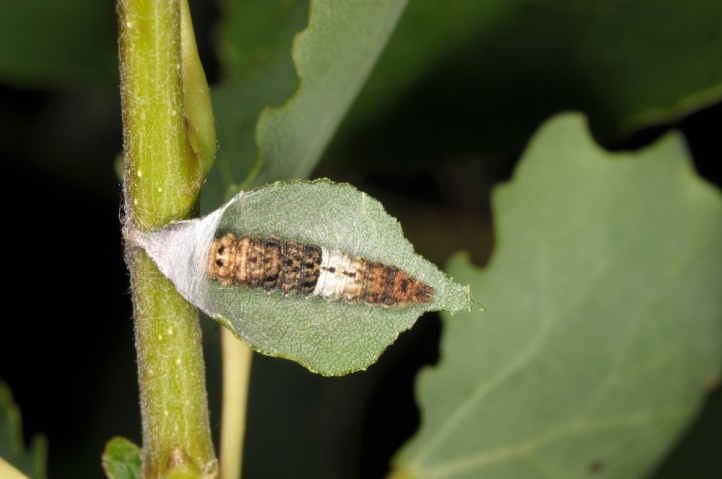 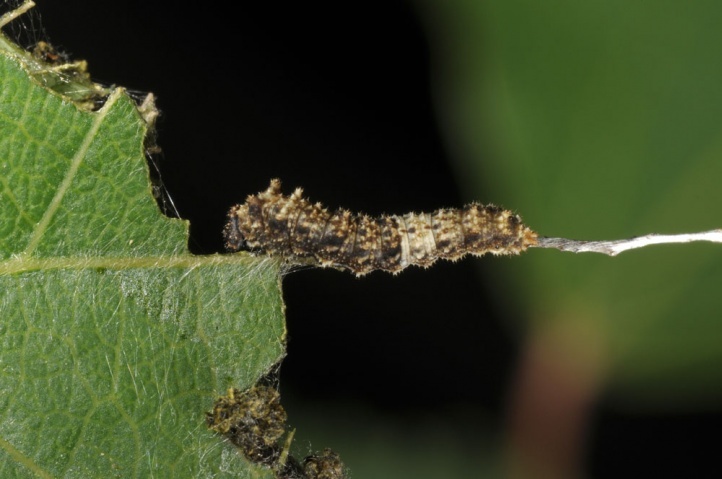 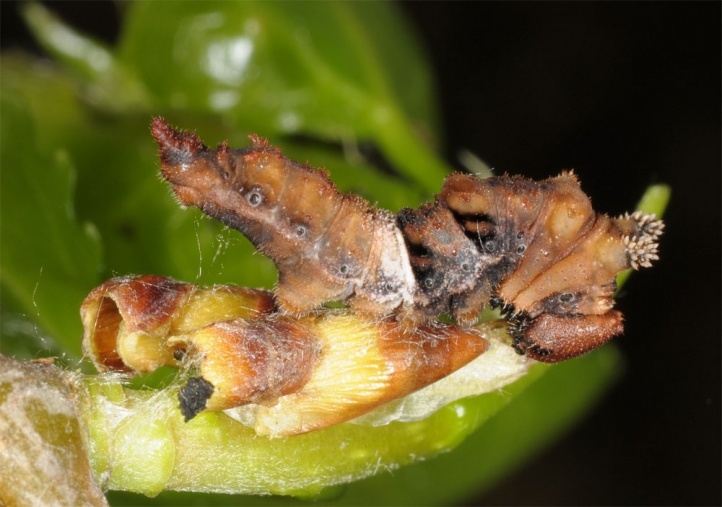 However, a lot of young caterpillars die because of parasitoids and predators. 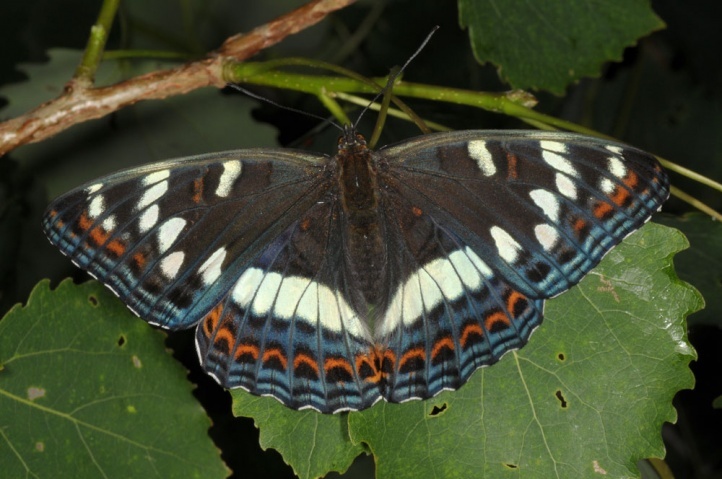 Limenitis populi is threatened with extinction, as moist and open coppice woodlands are becoming rarer and cover only smaller and smaller areas. 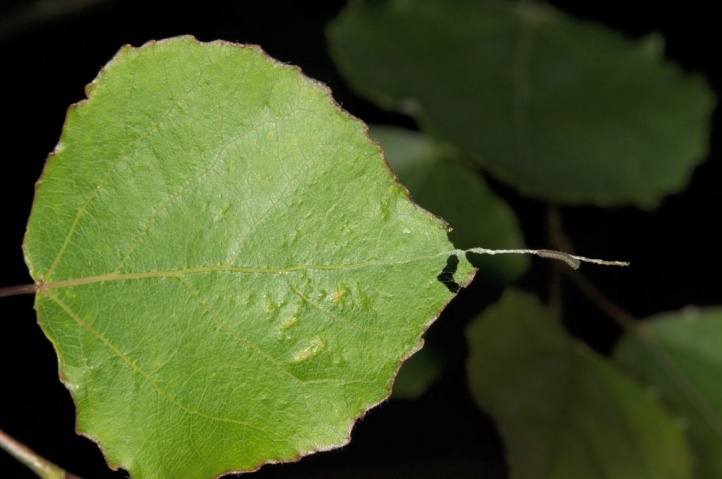 The aspen is still thoroughly eliminated from forests as worthless softwood. 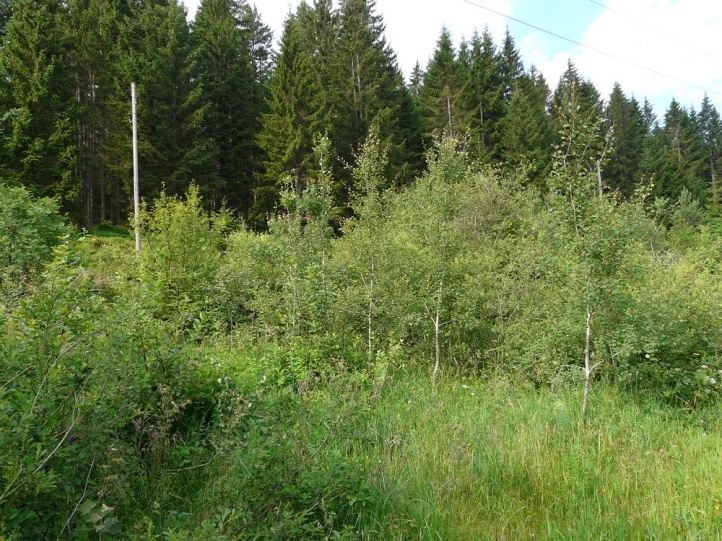 Therefore dense and dark forestations and nearly borderless forest edges without softwood mantle are in fashion nowadays (economic production maximization). 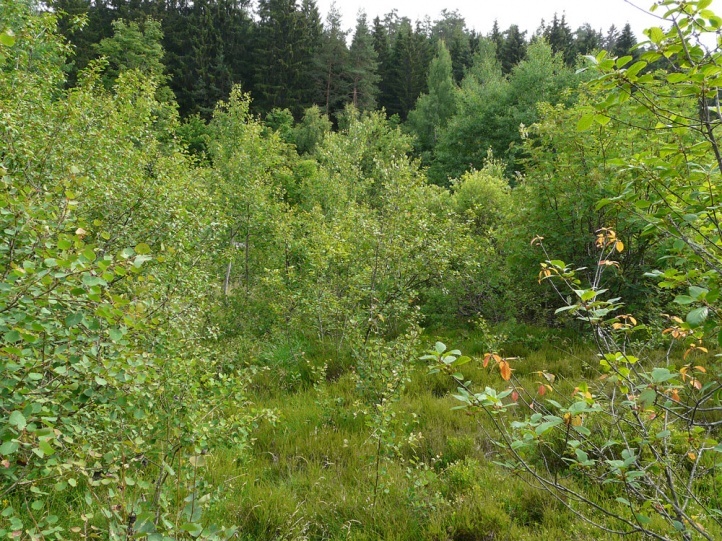 The few remaining habitats are sometimes even poisened with e.g. 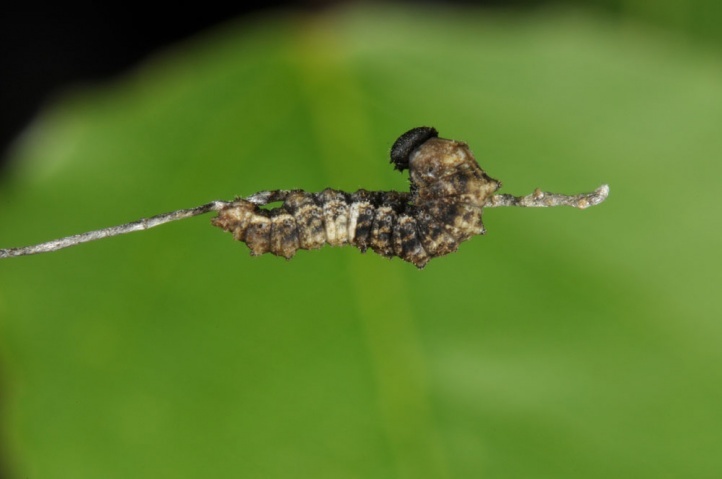 Dimilin (e.g. 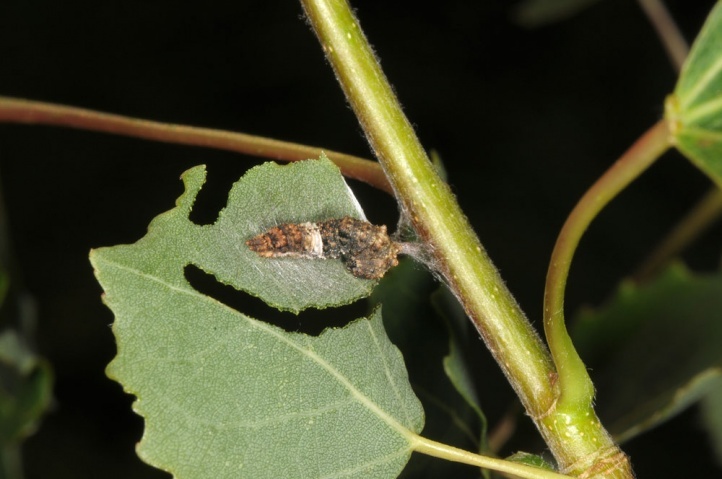 in Germany) if there is an outbreak of Lymantria dispar proliferation in the woodland. 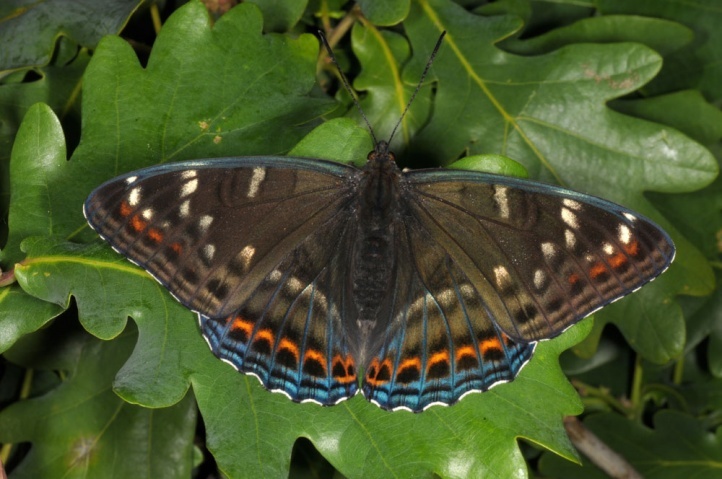 These local gradations are actually harmless and break down again in a natural way. 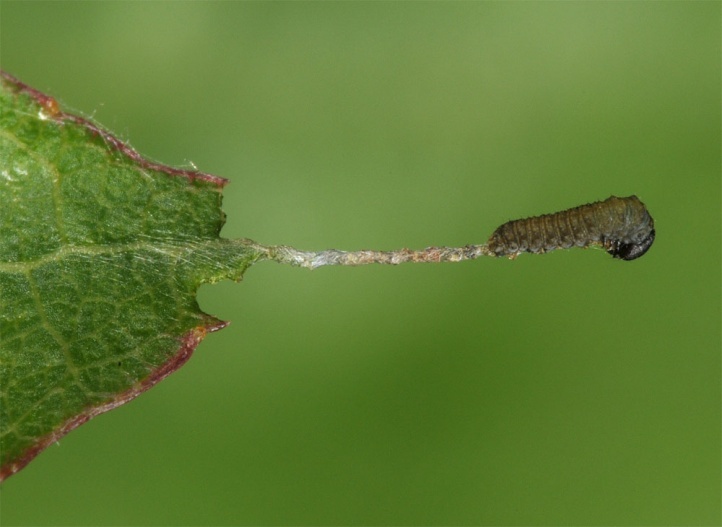 Also feeding of birds and care of wood ants in the habitat islands should have a smaller influence compared to the general habitat loss. 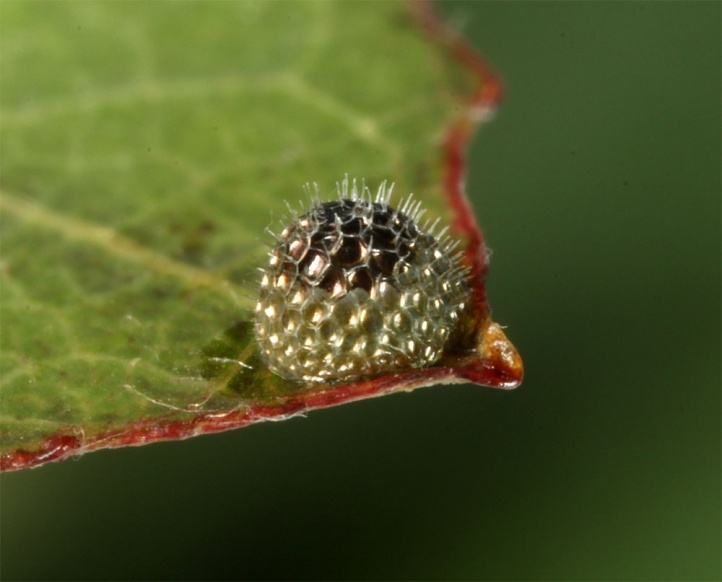 The rest populations that are weakened by this lack of optimal reproduction habitats are also more exposed to the climate change and its always milder autumn and winter times (Atlanticization). 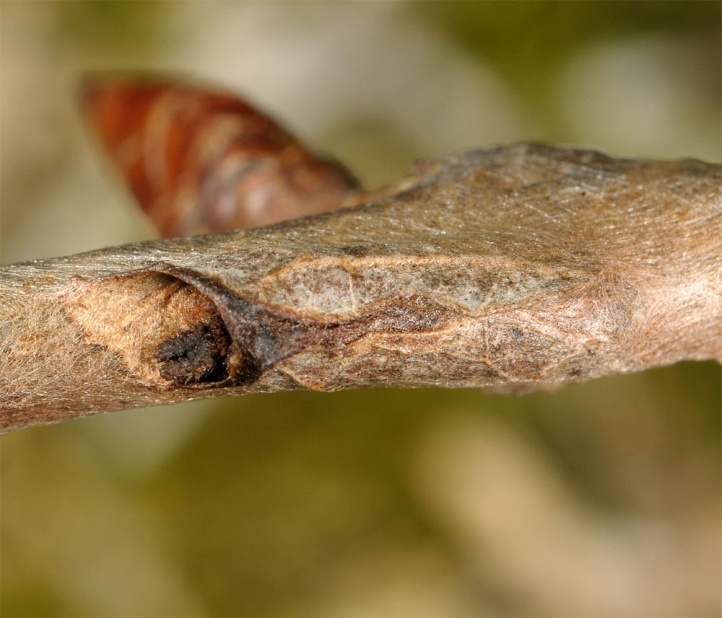 In Southern Germany Limenitis populi which seems to be adapted to cold winters thus has been pushed back to some relict populations in the cooler, more humid and ´forest rich uplands like the southeastern (continental) side of the Black Forest. 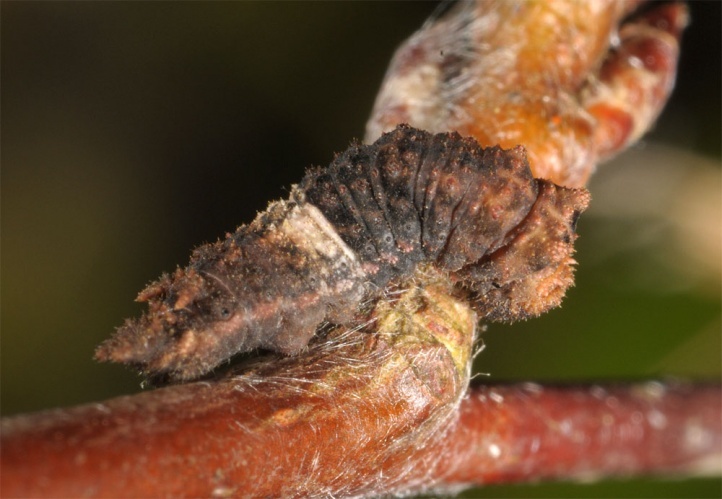 The total distribution extends from Central Europe through the zone of deciduous forests to Japan. 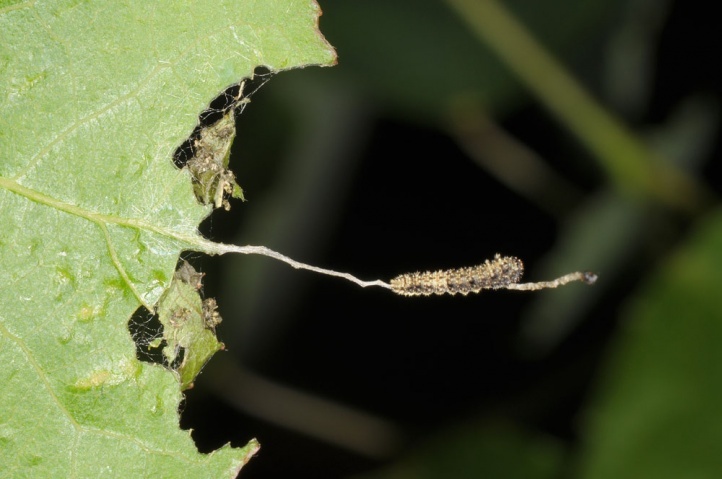 In Central Europe the distribution falls into more and more isolated pieces at the momnent. 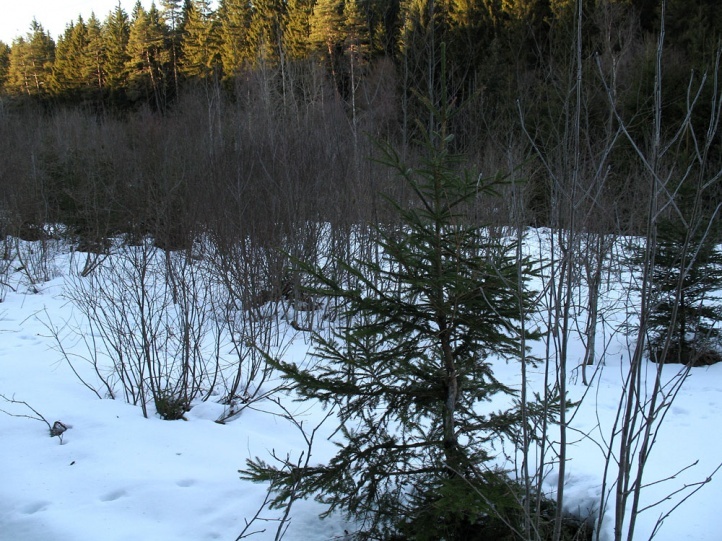 Remaining populations are mainly located in mountainous islands (Black Forest, Bavarian Forest).